Repair and protect your tresses with TIGI Bed Head Urban Antidotes Resurrection Repair Conditioner, a milky formula ideal for very dry and damaged hair types. The colour-safe treatment targets the damage caused by chemical dyes, mending strands and helping to form a defensive barrier against further breakage or drying out. Silky and lightweight, the conditioner smooths the hair cuticle to tame frizz whilst replenishing vital moisture to add silkiness and shine. Locks are healed, hydrated and healthy. Suitable for very dry and damaged hair types. 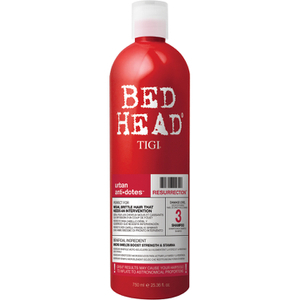 Apply to mid-lengths and ends of hair after shampooing. Leave up to 3-5 minutes and rinse well.